The Revolution Will Not Be Televised. But it will be on Facebook, Twitter and YouTube. 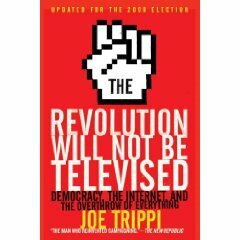 I just finished reading The Revolution Will Not Be Televised by Joe Trippi on the Nook app on my iPad. Great read for 21st century political consultants. It was a self-imposed homework assignment, for the work that I’ve been doing with Vincent Morgan, the Democratic candidate for Congress I’ve been working with for the past two years. If you haven’t read it (why would you?) it’s a good read. It was especially informative for me because in it, Joe talks about the various online and social media strategies Howard Dean’s campaign employed to build it’s base, push Dean’s message and raise money. To make a long story short, the Dean campaign was really responsible for the both the use and proliferation of the web and social media by political candidates. Without Howard Dean, there would have been no Obama. Period. What Howard Dean’s campaign did with the internet and social media, completely bucked traditional notions of what online communities meant, how to galvanize supporters and raise money. 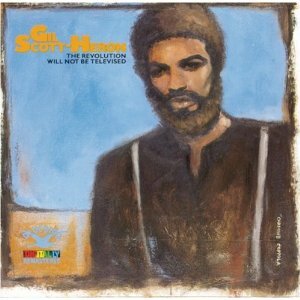 Trippi’s title, an homage to Gil Scott-Heron’s poem and song of the same title, refers to the fact that TV is no longer the dominant medium, especially as it relates to the manner and methods of running a political campaign. Gil clearly didn't know about iReporting back in the day! Where campaigns used to pour millions of dollars for television spots, in an effort to frame the issues and influence voters, Trippi posits that online forums, blogs, social media and the web generally, will have greater impact in future races. As I sit here, thinking about how to apply Trippi’s strategies to Vince’s campaign, I’m brimming with excitement. Last year, when Vince ran against Rangel, we knew out the gate, that we were in for an uphill battle. For one, Vince was a relative unknown. Rangel’s name carried all the weight in the world – even in the middle of his ethics controversy. Vince had no political experience, save a stint working with Rangel several years prior. The M4C team was pretty inexperienced. It was the first political campaign for most of us. He hadn’t raised a lot of money, which effectively meant that media buys (and virtually anything else that cost money) were out of the question. Even with Rangel’s ethical issues, he was still sitting on a (relative) war-chest. This year, it’s a different story. For one, Vince is no longer an unknown. While he may not evoke the same level of name recognition as Rangel, he is regularly featured in both local and national press. He’s a frequent political commentator on CNBC, having most recently offered is perspective after the GOP Iowa caucus. Although Vince still has no formal political experience, his previous run gave him political credibility and experience running a political campaign. Even though he’s never held formal office, he is being discussed as a viable Democratic candidate, in the same breath as, and alongside other established politicians. Team Morgan is staffed with experience. From his PR agency, Dash PR, to his finance manager, to his interim campaign manager, the team he’s assembled know their respective charges, and are ready, willing and able to execute accordingly. But the most important thing, is the impact that social media and online, are having on the strategies we’re developing. Unlike Charles Rangel, and the rest of the other candidates running (or planning on running) in the next election, Vince is truly technologically savvy. While other candidates have third parties blogging, tweeting, FourSquaring, updating their Facebook status and generally leaving social media to someone else, Vince is actively engaged in the management of his online personae. He actively posts articles, videos and pictures he finds to his website, personal and political profiles, and responds to comments he receives. If you haven't 'Liked" the page, do so now! And he makes it a point to ‘check-in’ with FourSquare, when he visits any of the restaurants, barbershops, cafes, stores and venues in his daily travels, staying engaged virtually with his growing constituency. More importantly, he knows how important it is to get the formula, of online and offline activities, right. As Joe Trippi noted in his book, virtually every political campaign, candidate and politician, has a website, Facebook page, etc. They would be remiss, in the post-Obama era, not to. But having an online presence, and utilizing it effectively, are two drastically different things. 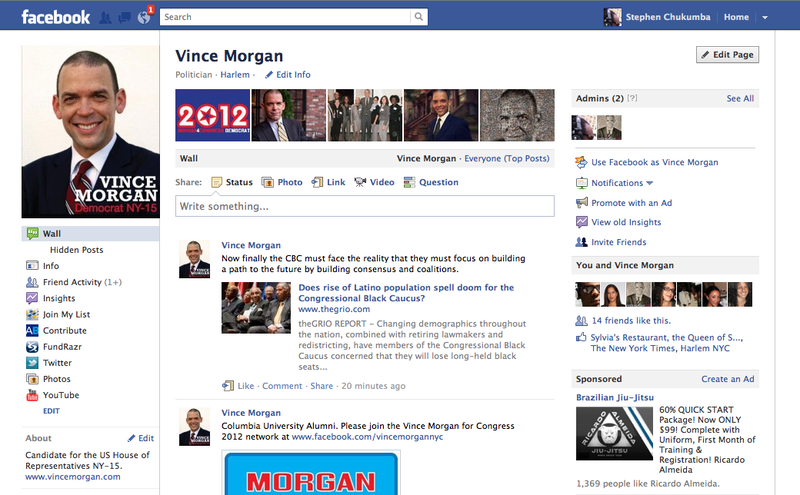 Our goal, in 2012, is to master the use of online and social media tools and put Vince in office. That means we’ve got to raise his profile, raise money, get people off their butts and into voting booths on election day. I’m confident that we’re going to do just that. Check in on the campaign from time to time and see how we’re doing.